This year I was compelled to use blues and whites in my Christmas decor and switch to a coastal theme. I love all the beautiful beachy decorated Christmas trees I see on Instagram and blogs from people living in the South, but I wanted to take a new spin on it. I wanted to focus on New England or Northeast style, and I ended up narrowing it down even more to focus specifically on Maryland style. I was drawn to oyster shells and was considering incorporating blue crabs, since we are known for them, but I could not make them work without it feeling tacky. I’m not saying it isn’t possible, but I just wasn’t feeling it when I experimented. So I stuck with the oyster shells, rich blue hues, whites, and neutrals, and I am so pleased with how everything came together! Oyster shells are a great coastal decor piece because they are so versatile and easy to work with. 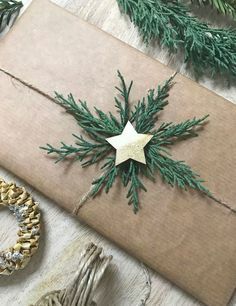 Once you clean and dry them, you can hot glue ribbon or zip ties to them and secure them to garland or your tree, or drill holes in them and string them together to form your own garland. I left the latter to the pros and ordered my oyster shell garland for my tablescape from Searchnrescue2 shop on Etsy. Bebe has lots of beautiful oyster shell and driftwood holiday decor and a variety of coastal decor for everyday decor. For my tablescape, I found a simple and neutral runner at Target and laid the oyster shell garland across it, scrunching it in areas. I wove in a big copper bulb garland. It was the perfect length, with just 6 bulbs. It’s often too short for other areas, so I’m really glad it worked here. It added soft subtle lighting and little splashes of copper. I added in a few pillar candles of various heights, flocked pine cones, copper flecked wood snowflakes, and large white pearlescent ball ornaments that resemble shells. For my banister, I decided to use a flocked garland I found from Joann Fabrics on Google Express for $6! It’s a 9 foot garland, so I purchased three. When you find something for that price, you grab as many as you think you might need because you can always return what you don’t. 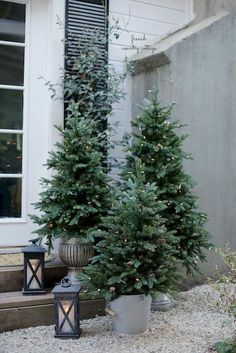 When I opened the garland and fluffed it, it was far from perfect, but I knew if I put two together, wove it around decor, or tied in a few different textures and ornaments, it would work just fine. I started connecting two garland together with zip ties and weaving lights through, not around it, because that is always a pain, especially when you are taking down your decorations after the holidays. And I like to keep it as simple as possible. Next, I hot glued zip ties to the back of oyster shells, attaching the oyster shells in small clusters to the branches of the garland by pulling tightly and close to the base of the garland to secure them. I slipped zip ties through wire rings at the base of navy blue ball ornaments then secured them to garland in the same fashion. Finally, I made a large bough with rich velvet navy wire ribbon. I hot glued a zip tie to the back of the bough and secured it to the base of the garland at the newel post. As you can see, hot glue and zip ties were my best friends this year! I kept the bathroom very simple this year. It already has a coastal theme with white wainscoting, neutrals and a striped shower curtain, a Maryland crab print, and driftwood wreath. I added a bough to the wreath, a snowflake hand towel, a big star ornament, a vase with a few sprays, and a few wooden ball ornaments. I did not purchase anything new to add to this space. When you have a small inventory of neutral holiday decor pieces you find on clearance after Christmas, you always have it to pull from in future years. They’re great for a bathroom or small space, where you want to add some decoration, but don’t want to go overboard. For my tree, I started by added large mercury glass and frosted ball ornaments. I did not have to add lights because my tree is pre-lit! Makes me so happy! Next, I added DIY ornaments I made this year using oyster shells and gold doilies. I’ll be sharing the DIY steps on the doilies ornaments soon! 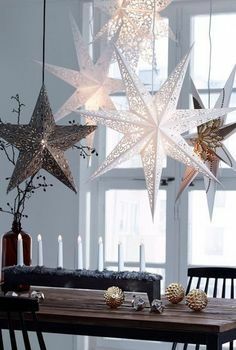 Then, I filled in the spaces with small navy ball ornaments, white rattan stars, and small mercury glass ball ornaments. Finally, I wrapped white mini pom pom ribbon around the tree and of course, clipped on my glittery rattan star at the top. Thank you so much for letting me share our home with you for the holidays! 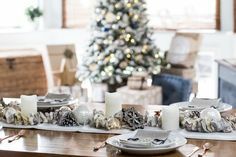 I hope you enjoyed my coastal Christmas home tour and feel inspired to try something new or add a new element to your home this year! Check back for more holiday home decorating tips, simple DIY projects, and gift ideas!